Tabaah Ho Gaye Full Song Lyrics with English Translation and Real Meaning Explanation from upcoming Bollywood movie Kalank. The heart breaking sad song has been composed by Pritam while Amitabh Bhattacharya penned the lyrics, Shreya Ghoshal sang this song with her graceful voice, the music is available on Zee Music Company. The Full length audio mp3 version of Tabah Ho Gaye from Kalank by Shreya Ghoshal is free to download and stream from Gaana, Wynk Music, Hungama, JioSaavn and other online music portals. 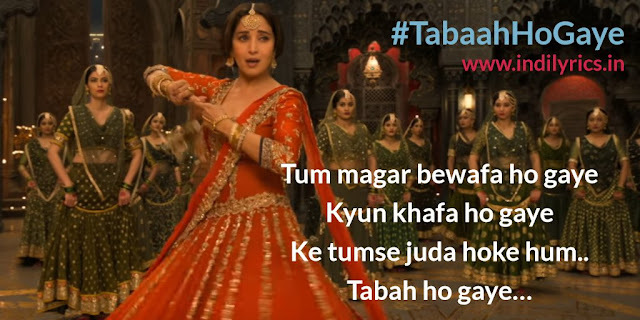 The music video of Tabah ho gaye features ever gorgeous Madhuri Dixit dancing classical Indian dance form which is soothing to eyes. But why did you cheat on me? Why you got upset at me? Ke tumse juda hoke hum..
Why did you get upset at me? How did I become unwanted to you?